From left: CHS History teacher Dan Gatts, Chloe Yocum, Abbi Carney and Cheyenne Conner. Not pictured is Riley McIntyre. More than 220 8th graders from across the state received recognition Friday as Knights of the Golden Horseshoe. Abbi Carney, Cheyenne Conner and Chloe Yocum from Cameron High School and Riley McIntyre from Moundsville Middle School are now Knights of the Golden Horseshoe Society after the induction ceremony in Charleston. CHS 8th grade History teacher Dan Gatts earned an honorary Golden Horseshoe. 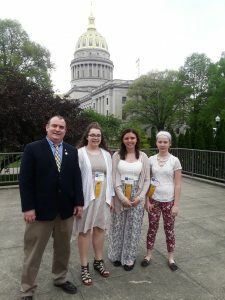 Since 1931, more than 15,000 West Virginia students have received the Golden Horseshoe Award in recognition of their knowledge of West Virginia history and culture. The program is the longest-running program of its kind in the United States. 2018 marks the 302nd anniversary of the Golden Horseshoe tradition, which began in 1716 when then-Governor Alexander Spotswood saw the need for exploration of the land west of the Allegheny Mountains, most of which is now West Virginia. Spotswood organized a party of about 50 men to explore the frontier. At the end of the exploration, he presented each member of the party with a golden horseshoe.